There is nothing more disturbing than a dirty oven when you are trying to cook a nice family dinner. Well, we can help you deal with this problem in a very cost – efficient way with our oven cleaning service available in the Maida Vale area. We are a well-recognized company with many years of experience behind our back. Our trained and trustworthy professional oven cleaners will make your oven look like brand new once again. You don’t have to lift a finger just book with us, it’s that simple. 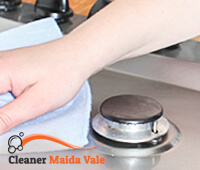 Our company has years of experience in working for the Maida Vale community. For that reason, our cleaners will be at your address professionally equipped and ready to work on the same day you call us. They are using only top of the shelf cleaning products and degreasers that are non – toxic to humans. You don’t want to cook in an oven that is full of toxic chemicals right? For the heaviest burned part of the oven like the rack and the oven glass, we use the dip tank method that guarantees 100% cleaning off all the grease. Our cleaners aren’t afraid to get their hands dirty and scrub every square inch by hand. That isn’t necessarily the best part of their job, but they do whatever it takes to get that oven in showroom condition. Oven manufacturers recommend that the oven should be professionally cleaned every six to 7 months depending on the usage. Of course, if you are a busy cook, the oven will get grease faster. We are using enamel protection, cleaning techniques, making sure your oven will look good after the procedures. 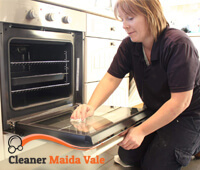 Our company guarantees you the lowest prices for oven cleaning services in all Maida Vale area, which is one of the reasons why we have so many happy returning customers. Don’t hesitate and ask for a free quote today!